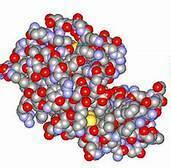 This page contains many different 3D-pictures of lysozyme structure. All these pictures are prepared with WebLab Viewer 4.0 with using coordinates of chicken egg-white lysozyme structure solved by X-Ray analysis at resolution 1.2 Angstrom. Water molecules in all pictures of lysozyme structure were excluded from the final PDB file to make protein pictures more clearer. All these pictures, except residue conservation one, were made in the same orientation, which allow you to compare different mode of molecular representations. 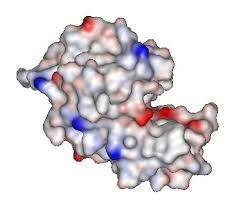 For more clearer vision, all 3D pictures of lysozyme structure are accompanied with the stereo version. All stereo-pictures are made in relaxed eyes split screen mode with relative rotation of 3.5 degrees. You can use these pictures for free for any non-commercial purpose, but you must refer to this web site (http://lysozyme.co.uk). For more details check copyright information. Ball-and-stick representation of the lysozyme structure. 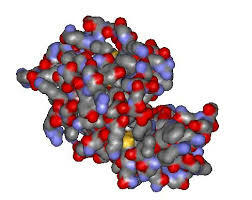 In this view all protein atoms are shown as balls and bonds between atoms are shown as a stick. Carbon; nitrogen; oxygen and sulphur atoms are coloured grey; blue; red and yellow respectively. You also can check stereo-representation of this picture here: Structure of Lysozyme ball-and-stick stereo picture. 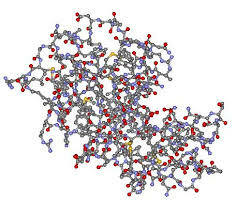 CPK model of the lysozyme structure. In this view all protein atoms are shown as balls with size of approximately equal to van der Waals radii. Carbon; nitrogen; oxygen and sulphur atoms are coloured grey; blue; red and yellow respectively. You also can check stereo-representation of this picture here: Structure of Lysozyme CPK stereo picture. Van der Waals surface of the lysozyme structure. In this view the smoothed surface of van der Waals radii is represented. Parts of the surface corresponded to the carbon nitrogen oxygen and sulphur atoms are coloured grey blue red and yellow respectively. You also can check stereo-representation of this picture here: Structure of Lysozyme van der Waals surface stereo picture. Solvent accessible surface of the lysozyme structure. In this view the solvent-accessible surface is represented. Solvent-accessible surface area was calculated by rolling ball method with a radius of 1.4 Angstrom ( Lee. B. and Richards. F.M. (1971). 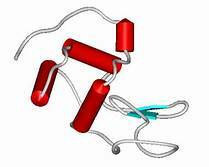 The interpretation of protein structures: estimation of static accesibility. J. Mol. Biol. 55 79-400). Surface was colored in accordance with the electrostatic potential of the surface where positive potentials are drawn in blue and red corresponds to the negative one. You also can check stereo-representation of this picture here: Structure of Lysozyme Solvent accessible surface stereo picture. The main chain of lysozyme structure is represented in schematic view - solid ribbon representation. Alpha-helices are shown by red colour; beta-strands are coloured blue and irregular loops are shown by grey rope. You also can see stereo-representation of this picture here: Structure of Lysozyme monomer solid ribbon representation stereo picture. The main chain of lysozyme structure is represented in schematic view. Alpha-helices are shown by red coloured cylinders; beta-strands are shown by blue coloured arrows and irregular loops are shown by grey rope. You also can see stereo-representation of this picture here: Structure of Lysozyme monomer schematic representation stereo picture. 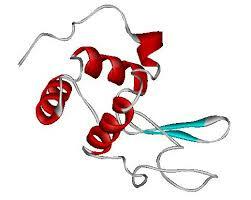 The CPK model of lysozyme structure. All residues are coloured by they conservatism. From dark blue for variable residues through white for average variable residues to dark magenta for completely conserved residues.Please note that for this picture the orientation of the Lysozyme molecule is different form that used for all other pictures presented on this page. You also can see stereo-representation of this picture here: Structure of Lysozyme monomer schematic representation stereo picture.